PIX Pulp and Paper - Fastmarkets RISI - Objective Insight. Better Decisions. These institutions trust PIX Pulp & Paper price indices because they are calculated from price data received directly from buyers and sellers. The prices are collected and managed to a high standard and are evaluated by a panel of experts. The methodology used to calculate the PIX indices is approved by the European Commission DG IV (anti-trust) and audited by Ernst & Young. The PIX Pulp & Paper Service is delivered direct to your in-box and published online every Tuesday. Objectively and reliably monitor global price developments each week of the year. Compare your price with the market average and determine if you are trading at a fair market price, for use in price negotiations. Understand whats driving prices, with in-depth analysis of industry trends. Quickly see how prices have developed since the PIX index release. This service helps you evaluate price trends over the longer term. It gives you all the benefits of PIX Pulp & Paper, with the entire weekly price history and monthly average since the index was launched. Win back the time from price negotiations by employing PIX indices in trading contracts instead. Simplify internal company pricing, by providing an independent market reference price for internal transactions. 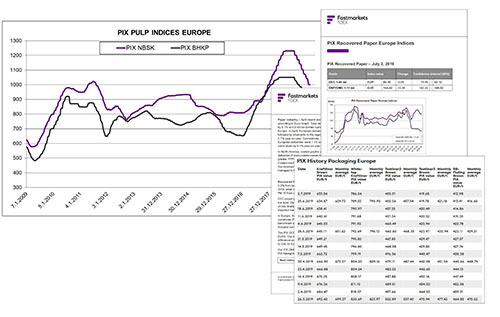 Manage the volatility of pulp and paper prices by using PIX indices as an independent market reference price to lock in prices. These contracts between buyers and sellers to hedge against price risks are offered through financial institutions. *This service is available for those companies who wish to use FOEX PIX indices in contracts. With a license, PIX indices can be used commercially as reference prices in trading contracts and pricing internal transactions. They can also be used as market reference prices in risk hedging contracts. PIX is a registered trade-mark owned by FOEX Indexes Ltd. The use of the PIX Pulp & Paper indices for any commercial purpose, including internal price agreements, is allowed only with permission from FOEX. If you are interested in any kind of commercial use of FOEX indices, please contact FOEX for further information.